Memorial Day’s trip on Stillhouse Hollow Reservoir was the tenth S.K.I.F.F. trip I’ve run for 2011. On this Memorial Day 2011 I welcomed aboard Seth Westerfield of Killeen, and his friend, Joseph Henry, also of Killeen. Seth Westerfield with 2 of the 54 fish we boated today. 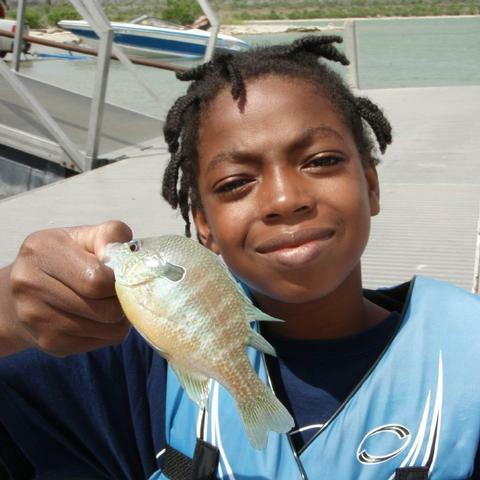 Joseph with a beautifully colored longear sunfish he caught in the shallows early in our trip. Seth is a pretty easy-going middle school student who lost both his mother and father not too long ago. His uncle and aunt, Staff Sergeant Keith and Kim Peterson took Seth in and are now Seth’s legal guardians. Keith is currently on a 1 year deployment with the 3rd Armored Cavalry Regiment in Iraq where he’s serving in the Field Artillery until his return in August. There have been some uncertainties in Seth’s life, but his frienship with Joseph has been a good constant for both of them. Joseph enjoyed a SKIFF trip during the very first year of the program’s existence, and “came along for the ride” today to be with his buddy. The day’s winds were supposed to surpass 20mph by noon (and they did), so, we planned our trip from 6:45a to 11:00a with me picking the boys up and Joseph’s mom returning for them. Seth had never been in a boat before and couldn’t remember the last time he went fishing, so, I coached him accordingly, starting with the basics. We angled for some sunfish in the shallows near Area 667 and in about 50 minutes boated a mixed bag of 28 bluegill sunfish, green sunfish, longear sunfish, and some jumbo blacktail shiners, all on maggots under slender balsa floats. Once the sky rid itself of the grey, low murk to the east, I headed out over open water and searched for concentrations of white bass. The fish I’m finding right now are between 22-30 feet on breaklines near the main river channel and are slowly making their way down to the eastmost, deep end of the reservoir where the majority of them will spend the summer. We found fish in 3 locations today and caught fish each time we found them, but, the bite was definitely off under the influence of the SSE wind versus the great success we’d experienced over our previous trip with a wind from the due S. At each of these areas, we’d find fish on sonar, position over them (or at least NEAR them, as the wind was blowing so hard that boat control was difficult), catch 3-4 very quickly, only to have the school settle down and become disinterested, giving up fish only occasionally until eventually the fish quit altogether. We boated 7 white bass at Area 769; we boated 6 white bass at Area 760; and we boated 12 white bass and one tiny channel cat at Area 765. 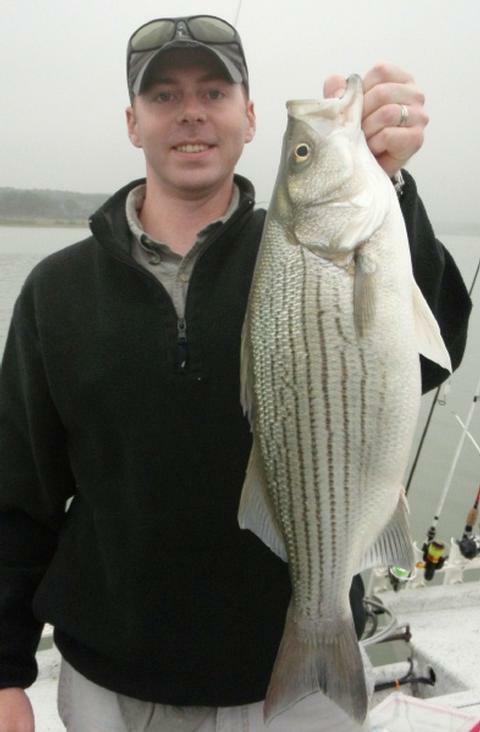 All of our fish were caught either on TNT 180 slabs in 3/8 oz. white or chartreuse or on Strike King Sandblasters in white or chartreuse. As we ran back to the dock for an on-time link up with Mrs. Henry, we had to run directly into the waves (which included swells by now). The boys got such a kick out of hitting the waves hard and taking on spray, that I trimmed the motor in to “amplify” the effect of both! Oh, I wish my kidneys and knees were still that resilient!! Well, there is no doubt that these boys enjoyed the adventure, the outdoors, the fishing, and one another’s company. Thank you, one and all, for what you’ve contributed to make this happen for kids like these. Wind: Winds were SSE12 at launch tapering up to SSE22 by takeout . Skies: Skies were about 80% cloudy with a fully obscuring cloud bank in the E. until around 8:00am. This morning I welcomed 3 young men aboard — Chris E., Andrew W, and Matt L. — all in celebration of Chris’ birthday. With limited experience and great attitudes, these boys were ready to catch fish, and catch fish they did!! It was a tough day to be an aluminum can out at Stillhouse today!! Chris’ mom and dad, Laura and Joey, had coordinated ahead of time to plan a special outdoor outing including just a few of his friends. After discussing things, we agreed that a bit of shooting, a bit of fishing, and perhaps a bit of swimming would fit into a 4 hour morning before it got too hot and the Memorial Day recreational traffic got too crazy. We met at 7:30 and were headed for adventure in no time. I brought two Crosman air rifles with iron sights, a bag full of aluminum cans, and a box of BB’s. We beached the boat, put sticks in the tops of the cans to keep them from sinking once shot, tossed the cans in the water and fired at them as they drifted away. When the cans got out of range, we cranked up the boat, picked ’em up and started all over again. The boys were all pretty good marksmen. Along the way we observed a blue heron, a water snake, limbs chewed by our local population of beavers, and the shell of a freshwater mussel. Once I saw the conditions improving for fishing (much wind and brightening conditions) I let the boys know that our “window of opportunity” was beginning to open. So, the shut down the shooting gallery and we began the hunt for fish. I’ve been on top of fish at Stillhouse for a long while now and that enabled us to go right to where the fish were. We made 3 stops and boated 43 fish in just over 2 hours’ fishing time. Our first stop came at Area 806 in ~27 feet of water. I saw small groups of 10-12 white bass spread here and there over a 30 yard diameter area here while watching sonar. We got the boat positioned, lures down, and caught fish in spurts of 2 or 3 as nearby curious schools would see and feel the commotion of our jigging and come in for a look. In our first 30 minutes or so we boated 12 fish, thus allowing all 3 boys to “break the ice”. We moved on looking for a stronger concentration of fish and found good sonar readings at Area 702/798. We made two “short moves” here over an hour’s time to amass the catch that we made, consisting of exactly 30 additional white bass. We boated about 2/3 of these via smoking and the balance by “blasting”. With our “be back at the dock” time drawing near and the fishing action here tapering off, we headed to look over one more area on the way back in — Area 807. This presented much the same situation that Area 806 did — small clusters of bottom-oriented white bass appeared here, there, and everywhere on this feature, but no strong concentrations anywhere. As we put lines down, Chris came up with one last fish. We agreed it was appropriate to let him have the honor of boating the final fish of the day, seeing how it was his birthday and all, and so we called it a good trip right there. Chris, Happy Birthday! You’re a fine young man and have chosen your friends well. Air Temp. : 76F at trip’s start. Wind: Winds were S8 at trip’s start, slowing ramping up to S16 by trip’s end. Bottom line: I dodged a bullet today. When I saw the forecast for a late-season cold front to come through and winds to shift to the north in the morning and go slack by mid-day, I was just shaking my head, knowing this was going to be like pulling teeth. From L to R — Pa, Sam, Jamie, and Joe. We were prepared to pull teeth but got to put the vice-grips away when a light breeze saved our hides!! Joe O. of Wills Point, TX, contacted me over a month before to set up two back-to-back trips. The first trip was to include himself, his 81 year old dad (“Pa”), Joe’s brother, Jamie, and Jamie’s son, Sam. This first trip was in honor of Sam’s high school graduation from Westwood High School in Austin (Go Warriors!). We set the dates for today and tomorrow. By last Sunday, the weatherman had today’s forecast down pat. I kept hoping for a change, but, as the day drew closer, the likelihood of a change grew more and more remote. By Tuesday, I phoned Joe to see if there was any flexibility in his schedule given that Friday’s forecast (with the return of a strong S. wind) looked great. There was no flexibility. So, we took lemons and made lemonade! As I got my first glimpse of Belton around 3:40pm, driving in for our 4:30 meeting time, I noted that the wind was just starting to puff from the NE after going flat calm over the midday period. That would help some. I ran sonar for 30 minutes over 2 different areas before my guests’ arrival — nothing! When all were on board we looked over two more areas with sonar — again, nothing! I felt like the bad dream was coming true. The NE breeze began to shift ENE and finally, targets on sonar!! As expected under high pressure conditions, the fish that could be found were scattered and suspended. We went to work with the downriggers and from ~5:00pm to ~7:40pm we managed to boat 36 fish including 1 small blue cat, 1 short largemouth, 2 freshwater drum, and a mix of 32 white bass and short hybrid stripers, all on small Pets. These fish came from 17-26 feet of water in an area bounded on the N, S, E, and W by Area 813, 814, 811, and 812, respectively, with Area 793 in the midst of these being the “spot-on-the-spot”. When a brief lull in the action occurred, we also downrigged over Area 794 and picked up 4 of our fish there. 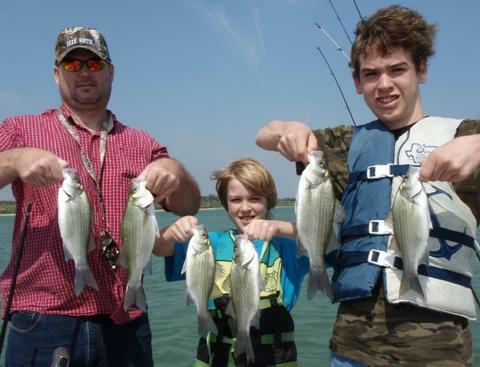 All during the time spent downrigging, we observed small schools of small to average-sized white bass very briefly break the surface and chase very small shad for short distances before sounding. This action slowly but steadily increased, leading me to think that if the winds stayed light, we’d see some catchable quantities of topwater whites near sunset. By 7:40pm, the occurrence of the topwater feeding was consistent enough that I felt we could change over from a downrigging approach to a casting regimen and do at least as well as we were doing on the Pets. We made the change and it paid off. The area in which we found fish with the downriggers saw more and more small schools coalesce as the light grew dimmer, and, using silver Cicada blade baits, we were able to more than double our catch in the last 70 minutes of the trip, taking our tally to 77 fish. These school fish were, on average, smaller than the ones we took on downriggers, but, on a day that started off looking like a recipe for disaster, we were glad to consistently boat fish from start to finish. The topwater action began in earnest at Area 811, then tracked westward to Area 012, then ended up near Area 027. The fish followed the contour, not a straight line from point to point. Air Temp. : 84F at trip’s start. Wind: Winds were NE3-4 at trip’s start, slowly turning ENE5-6 by trip’s end. I enjoyed fishing this morning with Steve N. of Temple, his son, Andrew, visiting from Chicago, and Andrew’s 4 year old daughter, Evelyn. Evelyn is a bright, cheerful, and very articulate young lady who, by the way, happens to have a knack for landing big fish! 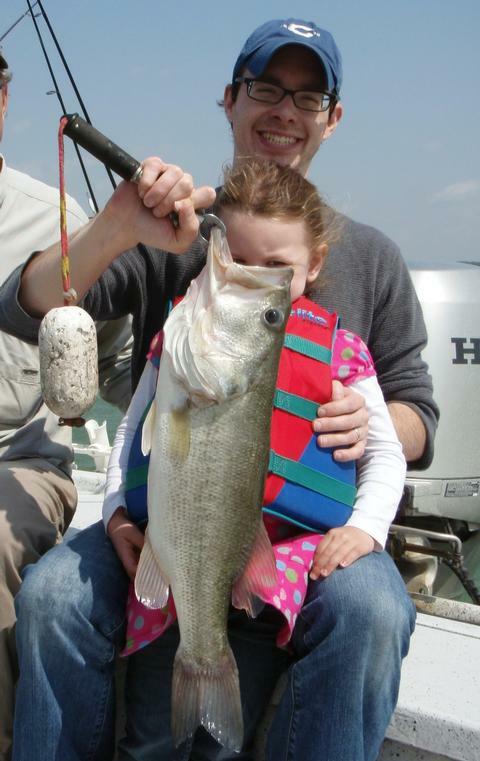 … this 4.75 pounder, also caught by the young lady in the pink dress (hiding)!! I was expectant about today’s trip given our fairly turbulent weather of late. The fish were due for a good, hard feed and this morning they put the feedbag on. We got going at 7am and, to ensure some initial success for little Evelyn, we fished for sunfish in the shallows near Area 667. Evelyn really took to the slipfloat method we were using and, to my surprise, actually stuck with it for over 70 minutes during which time she landed 13 sunfish (11 bluegill, 1 longear, and 1 green). After the skies brightened a bit and the sunfishing waned, we headed out to open water in search of white bass and the shad they feed upon. Sonar returns didn’t show much at the first two areas we looked over, then, at just to the WNW of Area 723 I spotted our first decent school of fish right on the breakline’s upper end. We got into a hover and began working 3/8 oz. TNT 180’s over these fish using a smoking tactic and began catching fish right away. 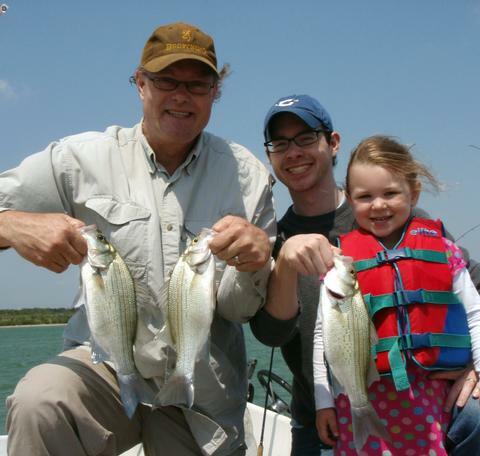 We boated exactly 24 white bass here before things cooled off. I had a strong suspicion that the fish either hadn’t moved far or that there would be more fish in this locale, as conditions were steadily improving with increasing winds and brightening conditions still shrouded by a grey, hazy cloud cover. Just yards away, at just WNW of Area 774 another slightly larger school of fish showed on sonar. Again, we hovered, got slabs down and smoked up a bunch of white bass. We spend the majority of our time here through the lion’s share of the morning’s feeding window. As things began to slow, I put tightlines out for largemouth and we were handsomely rewarded with a 3.125 pound largemouth and another just-keeper sized black bass in short order. As the action wound down here we’d upped our count to 63 fish. We checked two deepwater areas with sonar only and found little, then hit Area 792 and got really excited about what we saw as we motored in. Literally hundreds of white bass were carpeting the bottom and were up to as high as half way towards the surface. These fish were very aggressive and even approached the boat as we motored over them, just out of frenzied curiosity. These fish were only in 20-22 feet of water — one of the shallowest encounters I’ve had with significant numbers of white bass in a long time. We went to work on these fish and caught them both via smoking and, when they dispersed horizontally as they often do in shallower water, we also caught them via a blasting technique. 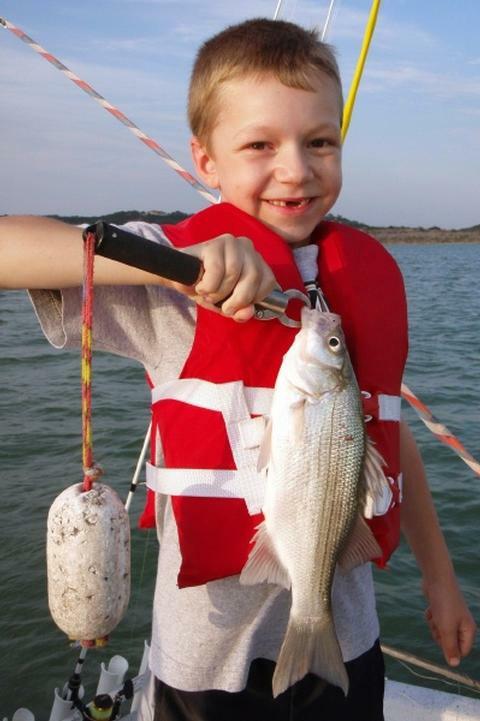 This accounted for not only white bass, but also a bonus crappie caught by Andrew. I informed Andrew that crappie were kind of a lethargic sort of fish and Andrew volunteered that he felt a kindred spirit with that species. Anyway, in just under an hour, we peeled through an additional 32 fish until the morning window finally closed on us at 11:28am. During the final morning feed here, I did drop one tightline down for variety’s sake and it yielded our largest fish of the trip, a 4.75 pound largemouth very capably brought to net by Miss Evelyn. We agreed at this point that we’d seen the best of it and headed back in very satisfied with our mixed bag today consisting of 1 crappie, 3 largemouth bass, 13 sunfish, and 78 white bass. Air Temp. : 70F at trip’s start. Wind: Winds were S8 at trip’s start, slowing ramping up to S15 by trip’s end. 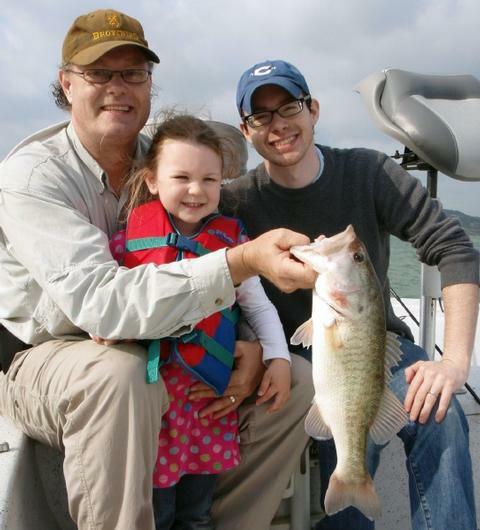 I fished this evening with returning father and daughter guests Jim and Shena S. of the N. Austin area. Jim and Shena pose with fish we boated before approaching thunderstorms drove us off the lake. Pre-storm fishing proved to be much more intense than the action following the storm’s passage. All three of us kept a wary eye on weather for the last several days leading up to the trip and thought we were going to be okay for a 4-5 hour trip “in the clear”. However, after about 75 minutes on the water, thunderstorms started popping up in large cells to the west of us, near Brownwood, and heading our way. We got going right around 4pm. 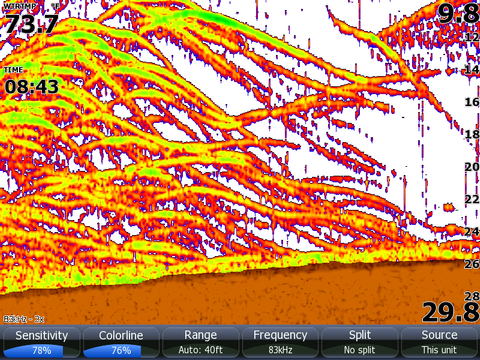 I checked out two areas with sonar and wasn’t impressed with the findings, so we moved on. As I ran sonar over Area 767, the bottom was littered with white bass over a stretch of ~30+ yards. 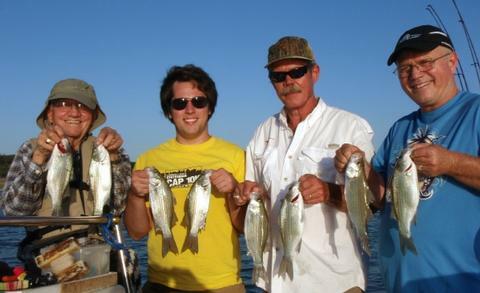 I buoyed these fish, got in a hover over them and all 3 of us began using a “smoking” retrieve for these fish. The fish were active and willingly took our presentations — 3/8 oz. TNT 180 slabs — for about 30 minutes straight. After the action waned a bit, we used a “blasting” technique to reach out beyond sonar and tempt fish that hadn’t seen our slabs. This accounted for several more fish over another 15 minute period. 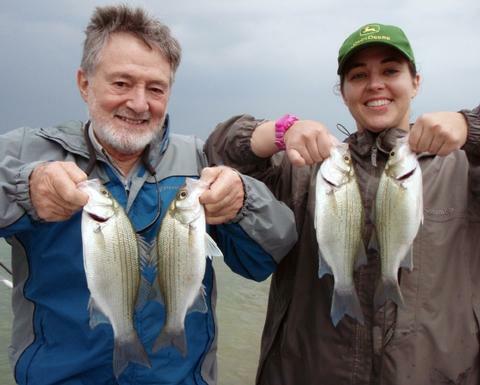 We had now boated exactly 37 white bass in less than an hour’s time, all from a relatively tight area here. Things were going well when, very suddenly, the wind shifted and cooled, and I knew a storm was either approaching or falling apart. I checked in with home base and found that 2 bands of thunderstorms were headed our way, so, we packed up very quickly and headed for safety to wait it out. After about an hour’s wait time we returned to the water to very different conditions. The skies had brightened and the winds were light from the WSW. We returned to Area 767 and found more fish suspended than on bottom, but focused on those bottom oriented fish by fancasting using a blasting tactic. We all picked up a few more fish that way, and then as that was tapering off, saw some light topwater action from white bass in this general vicinity (a few yards to the NW). We re-rigged with cork rigs and managed to put a few in the boat this way before the schooling action died as the wind increased a bit more. We left these fish and searched other areas but found little, and wound up returning to the scene of the surface action after the winds died to near calm as sunset approached. We boated a final 2 white bass here and as far S. as Area 118 and 119 as the setting sun brought the surface action to a close. In all, we wound up with 49 fish for our efforts; 37 came in the 75 minutes before the storm, and 12 more came in the 2.5 hours after the storm. If there was ever a doubt that winds and barometric pressure affect fish, this trip would have been the cure for it. Skies: Skies were grey the entire time, with clearing in the west following the storm’s passage. 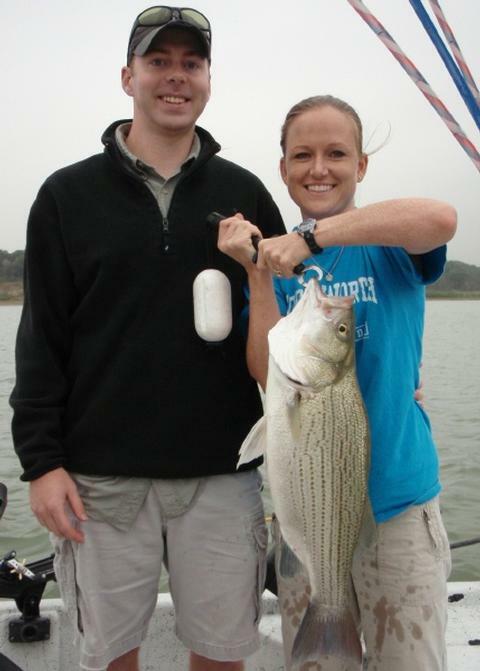 This morning I fished with Ryan and Lacey S. of Temple. The highlight of our trip was this pending Belton Lake Catch & Release category hybrid striped bass measuring exactly 25.50 inches. Lacey S. with her pending lake record hybrid. It measured 25.50 inches long (tail squeezed) and weighed 8.00 pounds on a certified Boga Grip. Check out the thickness of the “neck” and tail section on this fish. 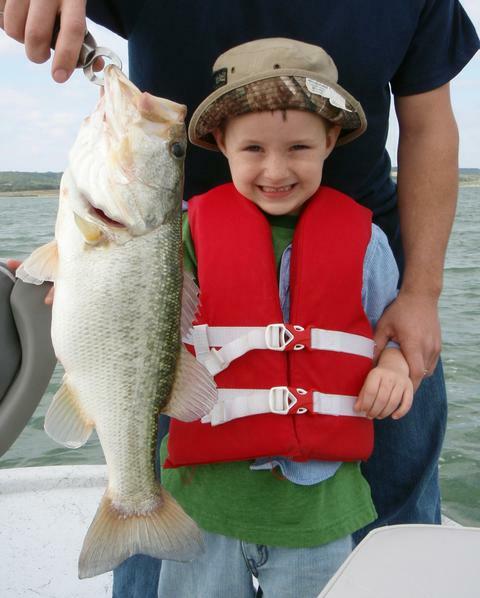 Ryan holds his own 5.75 pound hybrid, which, on any other day would have been cause for celebration in and of itself. After a very turbulent afternoon and evening last night with heavy thunderstorms covering the area dropping 1-4 inches of rain locally, we got a few hours of fishing in this morning before additional bands of thunderstorms redeveloped and drove us off the lake by 10:35am. Ryan works in Anesthesiology at Scott and White and has been out with me on 3 other occasions (all of which included weather-related difficulties!!). This was the first time Lacey came aboard — but hopefully not the last because she is definitely good luck!! Our plan today was to focus on netting and fishing with live shad for whatever species might be tempted by them. Catching shad is never a “gimme”, and although May is usually an easy go of it, shad respond to weather extremes, so, I wasn’t sure what to expect as far as effort required to net our bait today. Ryan was interested in being part of the bait gathering process, so, he arrived earlier than he would have for a fishing trip and brought his own cast net with him. All the worry was for naught, though, as soon after launching, I saw literally thousands of shad in the pre-dawn grey light blanketing the surface near Area 663. Two throws filled the 35 gallon bait tank with enough left over to use for chum and that chore was over!! Since it was still fairly dark, we fished from Area 663 to the mouth of Area 184 and boated 2 largemouth and 2 smallmouth with one other smallmouth jumping and throwing the hook. These fish were keyed in on the bait here. 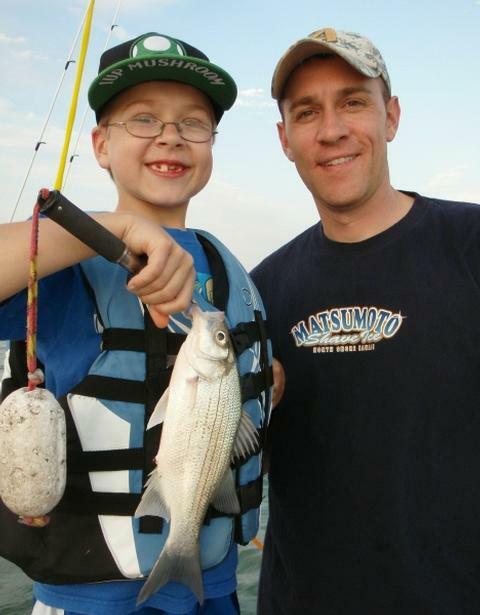 We also had several white bass swipe at the Spook Jr.’s we had on, but none made it into the boat. After the skies went from dark grey to lighter grey and I was confident that it was light enough to fish deeper, we headed to Area 788 and found fish holding close to the bottom from 25 feet on up to about 20 feet. The very first time I dropped a slab down and smoked it I got a white bass, so things looked good. I had Ryan and Lacey drop down and work their slabs for a while and we enjoyed limited success. Next, we expanded our coverage of the bottom by tossing Sandblasters out away from the boat, and we worked up a few more. Still, based on the sheer number of fish we saw on sonar versus what we were catching, I could tell the fish were sluggish (as they often are in turbulent or changing weather conditions). As things got slower, we moved on to fishing with live bait. 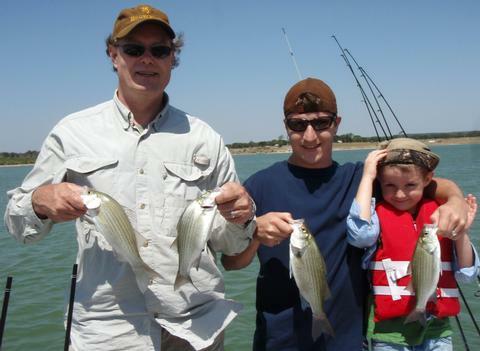 In all, we boated 9 white bass and 1 short hybrid on artificials before things slowed to a crawl. We then fished with up to 6 tightlines over the course of the rest of the morning, baited with threadfin shad ranging from 2.5 to 5.5 inches long. In summary, we boated 4 keeper hybrid, 2 keeper white bass, and 1 average blue catfish on the bait rods before weather began to threaten. The last of these four hybrid came right before we pulled lines in. By 10am we were scooting across the water and back at dockside as the first audible rumbles of distant thunder to the SW began. By 10:35 it was thundering, lightning, and pouring down rain. We considered waiting it out in the parking lot, but didn’t, and, in hindsight, that turned out for the better. The electrical storm was followed by high winds. Conditions didn’t calm until nearly 2:20pm. Congratulations, Lacey, on your big catch. 8 pound hybrid are truly a rarity these days! It’s part of Army life — pickup up and moving lock, stock, and barrel every few years, but some families you just really hate to see head on down the road. And so it is with the Hawthorne family — Aaron and Shelley, and their 5 kids, Kade, Cody, Connor, Ethan, and Alexis. This coming Friday starts a 2,300+ mile drive taking them to northern Maine and life after the Army. 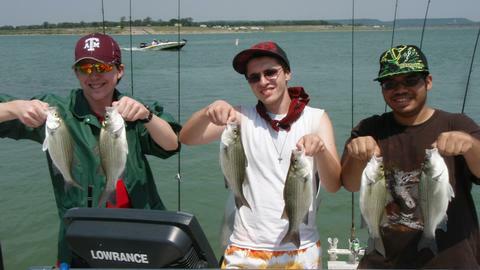 Aaron (L), Connor (C), and Kade (R) with our best 6 fish culled out of a take of 78. Here’s what was going on beneath the boat at quarter to nine this morning!! Today we did a little farewell fishing trip as a way to say goodbye. Yes, cards and well wishes are nice, but, if you knew these boys, you’d know this was a whole lot more appropriate. With the early morning bite still being pretty questionable (I fished solo then and only picked up 4 fish from sunrise to 8:00am), I scheduled our meeting time for 8:00am, and actually boated our first fish at 8:35am after “smoking lessons” and checking out 2 non-productive areas with sonar. We found the first concentration of fish (and the best action of the morning) on the slope and upper end of the breakline at Area 784. We “smoked” with TNT180 slabs in 3/8 oz. white and boated 48 fish in under 40 minutes. The bite died pretty suddenly after that, making me suspect some big predators had moved in. We continued searching and found fish at 3 more areas. Area 766 was a “flash in the pan” with 5 fish perking up right away and the school settling right back down and becoming lethargic. We found fish once again at Area 785/786/079. This covers a patch of bottom 20-30 yards in diameter. Fish were clustered in distinct bunches here and there and were getting increasingly unwilling to move to our baits or the commotion created by hooked schoolmates. We had to make several short “hops” around this feature to continue to catch fish. When all was said and done, we’d boated 21 more fish here, again, all on TNT180’s. By around 11:00am we’d seen the best of it, and, with winds heading toward 20mph and the bite getting soft, we decided to call it a good morning right there. Aaron, you’ll have to let me know if white perch, yellow perch, togue, bullheads, cusk, or any other “Yankee” fish like their slabs “smoked”!! I hope your travels are safe and that your new start in Maine is all you hope for. May God bless your family. Wind: Winds were S10 at (obscured) sunrise, and slowly increased to S18 by trip’s end. Skies: Skies were 100% greyed over this morning, slowly clearing beginning around 8:00 and then totally clearing and turning fair toward midday. This morning I welcomed returning guest Steve N. of Temple aboard, this time with grandson, 6 year old Caleb, and Caleb’s dad, Ryan. Caleb gets a little help from dad holding up his 3.25 pound largemouth we boated on live shad this morning amidst a school of aggressive white bass. Steve (a.k.a. Grandpa Baboo – Left), Ryan (center), and Caleb (right) pose for a “guys’ group photo”. We’ve had this trip on the books for several weeks and, as we corresponded this past week, Steve let me know that “Our number one goal is to keep Caleb on fish…”. So, with that in mind and with the white bass fishing at Stillhouse going gangbusters the past few weeks, Stillhouse once again got the nod and did not disappoint. I decided to start our trip a bit later than usual given Caleb’s age. Over the past two weeks I’ve encountered a hit-or-miss early morning topwater bite, but, even when it is “hit”, accurate casts and maintaining proper bait depth are essential. Both of those are well beyond the ability of a 6 year old, so, we delayed our start time to coincide with when I thought the deepwater bite might get going. As we launched, we got over some deep water and did some practicing using the smoking technique so everyone was familiar with it and so Steve and Ryan could both coach and help Caleb. We checked out two areas to no avail (and not surprisingly, as the skies were still heavily overcast). The third place we looked at, Area 783, was just “lit up” with fish. These fish were just beginning to coalesce on this area, as I could see bunches of fish in distinct groups not yet blended together for a feed holding here, there, and everywhere in close proximity to Area 783. I went ahead and put us into a hover over these fish and got everyone situated. On our first drop we all immediately got hit and up came 3 healthy white bass. This area continue to produce for 2+ hours straight, giving up exactly 109 fish, of which 104 where white bass (most in the 1, 2, and 3 year range), 4 were largemouth bass, and 1 was a drum. To their credit, Steve and Ryan understood the importance of keeping the momentum going when it comes to fishing for schooling fish, so, they did all they could to keep baits in the water and not allow for lulls in the action. When things did cool down a bit, we chummed and put down a single tightline with live shad. That rod rarely sat for more than a minute without garnering some manner of attention. Our largest fish of the day, a 3.25 pound largemouth (shown above) landed by Caleb, came on a large threadfin shad on this bait rod. Steve’s goal was to fish until Caleb was ready to go, and, by around 11:15 or so we seemed to have reached that point. The fish were getting more and more lethargic, and the “lunch factor” was kicking in for his little stomach. So, we started heading in when Caleb whispered to Steve, “I want to fish some more.” Well, you can’t argue with that! So, we adjusted course and headed to Area 782 and found some reluctant, albeit still biting white bass here in about 26 feet of water. We got our baits down to them and had to work a bit to get them interested. 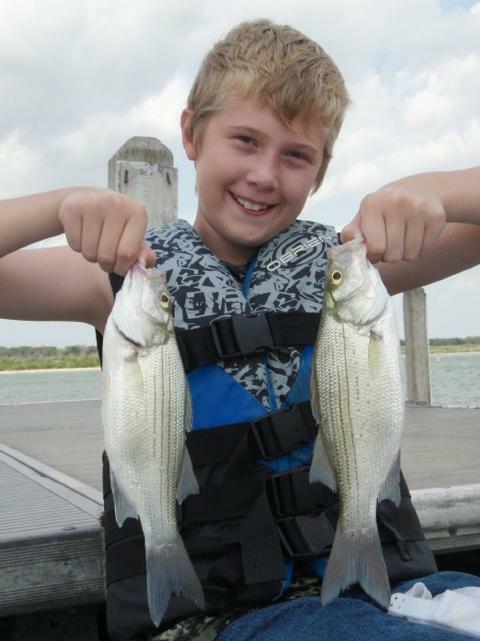 I pulled up one, Ryan nabbed two, and, we hooked one last fish for Caleb. That satisfied his desires and we (once again) headed to the dock — I believe I head Five Guys Burgers and Fries mentioned. I couldn’t have asked for a better scenario with a 6 year old on board that we had today and that’s really a blessing. Wind: Winds were S10 at (obscured) sunrise, and slowly increased to S13 by trip’s end. Skies: Skies were 100% greyed over this morning, slowly clearing beginning around 9:35 and then totally clearing and turning fair toward midday. This evening’s trip was the ninth S.K.I.F.F. trip I’ve run for 2011. The Raymo family contacted me to see if they could chaperone Luis on a SKIFF trip and pay the way for their own boys to come, too. 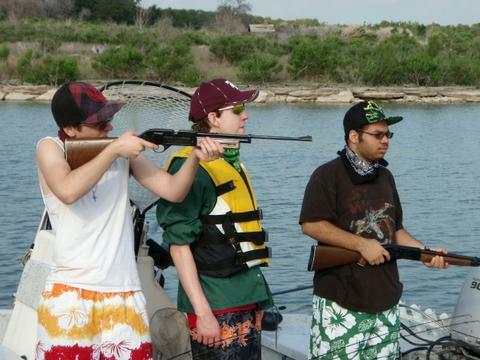 I told them I thought that’d be a great way for Luis to get an opportunity to fish. I’d fished a very productive morning trip, boating 127 fish, and so had “good intelligence” on where the fish would be this evening. We met at the boat ramp just before 5pm and got right to work. I anchored us out in 25 feet of water and made sure the boys were performing at a least a B- level on their “smoking” technique using a slab spoon before we went in search of fish to practice that technique on. The boys all got the hang of things very quickly, and so we began the hunt. The fish were just getting perked up for the evening feed and were a bit sluggish as we arrived, so, we had to keep “hopping” around this general vicinity to provoke still-sluggish fish to hit. We boated a total of 51 fish here by 6:35pm when the bite began to soften. We looked over a few other areas and I finally saw what I liked at Area 103/549, and that was tightly bunched white bass holding 12-14 inches off the bottom on the windblown side of a main lake topographic feature (a hump). Once I got us into a hover, the fireworks began. When all was said and done, we’d boated exactly 30 more fish here by 7:45. Due to a thick cloud bank to the west, our “sunset” came early as the clouds obscured the setting sun and darkened the waters prematurely turning the bite off once and for all. 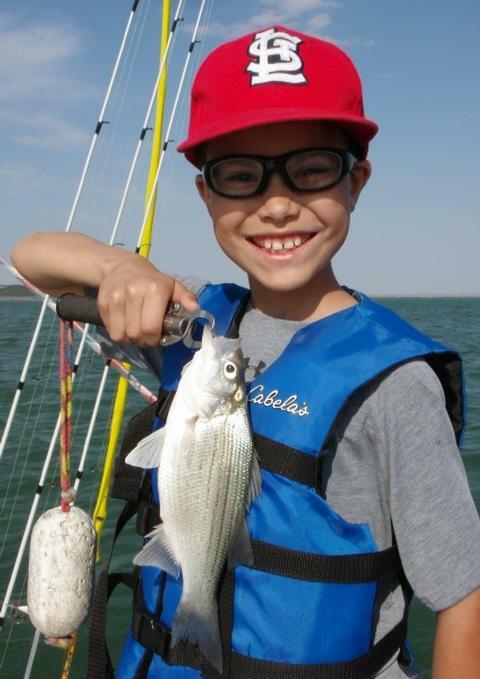 Our tally would stand at 81 fish, every single one of which was a white bass. I appreciate Mike including Luis in his own family’s activities while Luis’ dad is away … what a great way to model concern for others to his own boys.